Freezing point depression is simply the process of LOWERING THE FREEZING POINT OF A LIQUID by adding a solute to it. Ordinarily, water freezes at 32°F (0°C), but can you add salt to lower it’s freezing point to 20°F (-6°C). That’s why we use salt to melt ice on the road in the winter! Adding non-volatile substance to volatile substance lowers the temperature for freezing point. Nonvolatile refers to a substance that does not readily evaporate into a gas under existing conditions. At freezing point, the particles no longer have the kinetic energy to overcome the intermolecular forces. During freezing, the molecules instead of being able to bounce around randomly settle to a more organized structure called the SOLID STATE. The freezing point of a solution (solute + solvent) is always lower than that of a pure solvent. That is because the solute prevents the molecules from getting together into an organized structure and the temperature has to fall a lot lower to get rid of all the kinetic energy that causes the molecules to bounce around. Example, salt solution has lower freezing point than water. 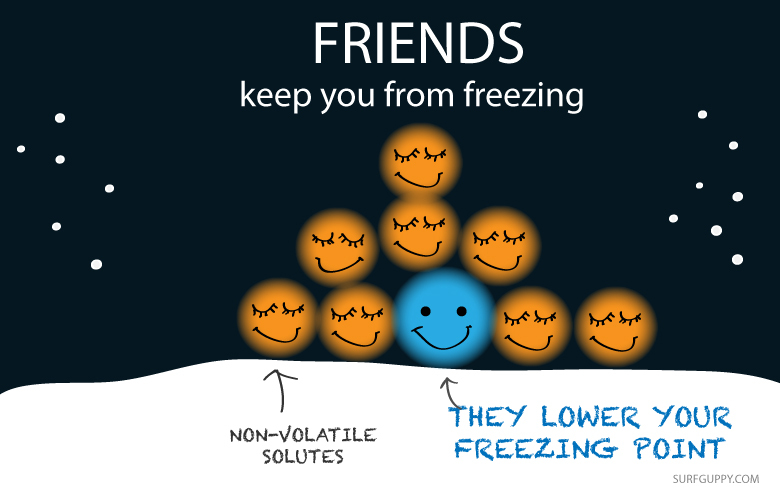 The freezing point of a solution (solute + solvent) is always lower than that of a pure solvent. Freezing-point depression describes the process in which adding a solute to a solvent decreases the freezing point of the solvent. Examples include salt in water, alcohol in water, or the mixing of two solids such as impurities in a finely powdered drug. 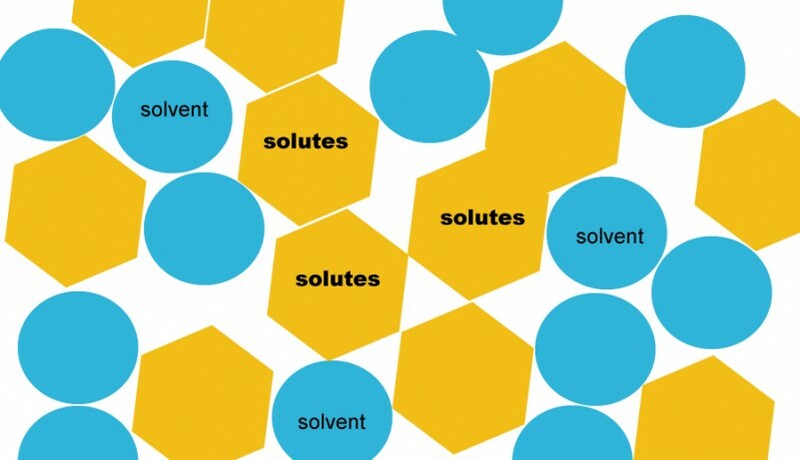 In the last case, the added compound is the solute, and the original solid is thought of as the solvent. The resulting solution or solid-solid mixture has a lower freezing point than the pure solvent or solid. This phenomenon is what causes sea water, (a mixture of salt (and other things) in water) to remain liquid at temperatures below 0 °C (32 °F), the freezing point of pure water. The equation enables you to calculate how much change in the freezing temperature of a solution after adding solutes to it. 1.60 g of naphthalene (C10H8) is dissolved in 20.0 g of benzene. The freezing point of pure benzene is 5.5ºC. 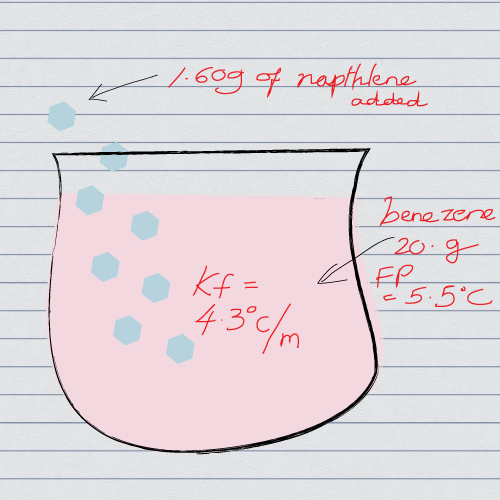 What is the freezing point of the mixture, given Kf of benzene is 4.3ºC/m? When you encounter a question, it is always a good idea to draw a rough sketch and label it.